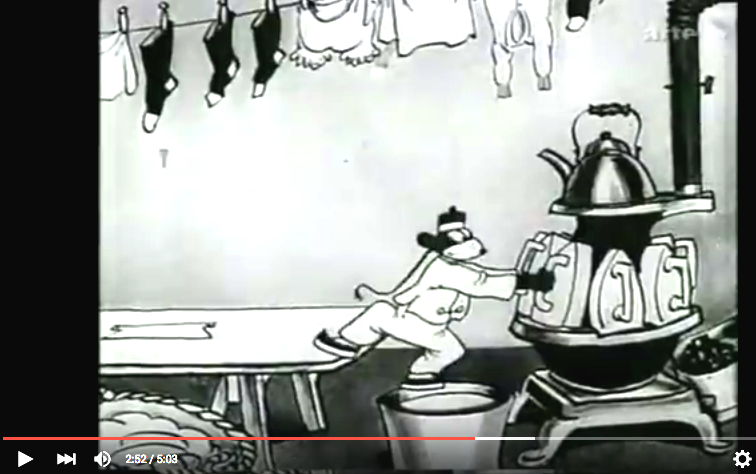 One popular 1930 animated film by Terrytoons portrays workers in a Chinese laundry but is given the misleading title, Chop Suey, probably because of the popularity of that Chinese restaurant dish. The association of Chinese with opium smoking is depicted by showing two mice going to a Chinese laundry where they buy opium. The cartoon depicts the laundry operation as an assembly line of robotic ironing. The cartoon animation shows a a Rube Goldberg-like mangler squeezing out excess water after washing items. Another film, one of a series of animated films starting in the 1930s by a Disney animator, Ub Iwerks, featuring Flip the Frog (who looks more like a mouse) titled Chinaman’s Chance shows Flip and his dog tracking an escaped criminal, Chow Mein, who disguises himself as a laundryman. His dog follows the scent of Chow Mein to the “Ob Long” Chinese Laundry. Flip confronts Chow Mein with a WANTED poster containing his likeness. Chow Mein pretends to be a laundryman by ironing clothes but the dog exposes him. For a while, Chow Mein gets the upper hand, and for a moment is able to stab Flip who is lying on the ironing board, but eventually Flip and his dog prevail and Chow Mein is placed back in jail. 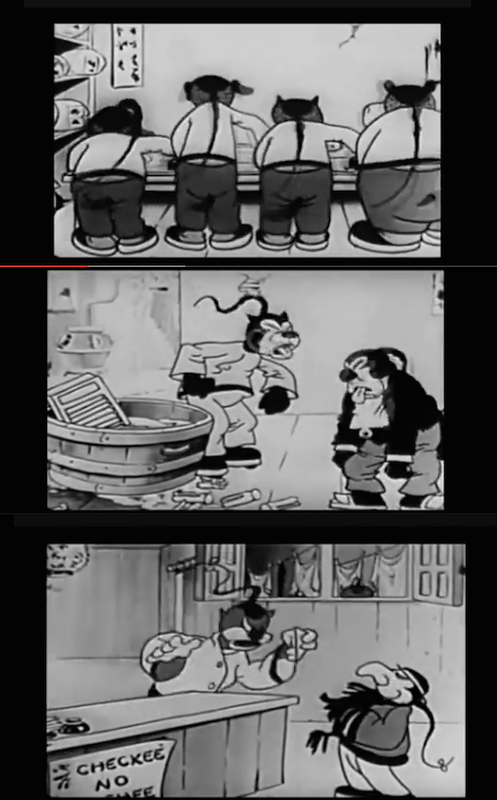 Aesop’s Fables Laundry Blues (1930) is yet another animated view of Chinese laundrymen that mocks and insults them for laughs.